Well I mentioned in a recent post how I had found my love for a new product of ours …. Stix2 Pick Up pencil. So I thought it might be a good idea to do a little ‘road test’ of this item so you too can find the loooove for this fabo little tool to have in your kit. Now for me I believe in investing in quality basic essentials so I can produce pieces of work that I’m excited about. 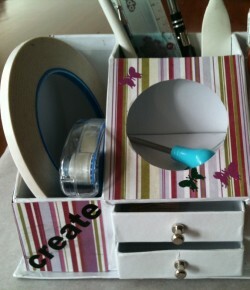 So I have my quality Creative Memories photo cutter, 12″ cutter, my Cuttlebug Die Cutter and my Cricut Create Machine. All the basics to set me on my way. Then I have my over flowing pencil case of tools – you know the pencils, white & black gel pens, erasers, ‘cheese’ eraser, pencil blade, small scissors – THEN I have my GEM Tool …. yes a bamboo skewer with blu tac! Don’t laugh, I’ve seen ‘Gem Setters’ and thought what gimmicks – I can do a ‘budget’ version. So I have worked for about and year or two with ‘MY’ GEM Tool. It picked up my bling very easily so all must be good??? However, I would often curse it because I’d still have to fiddle to get the Gem from the Blu Tac onto the glue spot. Hmmmmm it did get frustrating but not wanting to spending a few $$$$’s I perserveered with my little tool. This was however, until a few weeks ago when our NEW STOCK arrived and so too this PENCIL – YES a PENCIL. To us all it looked like a white pencil that hadn’t been sharpened. How on earth is this ‘Tool’ going to be better than my ‘GEM Tool’ I thought or those already on the market! 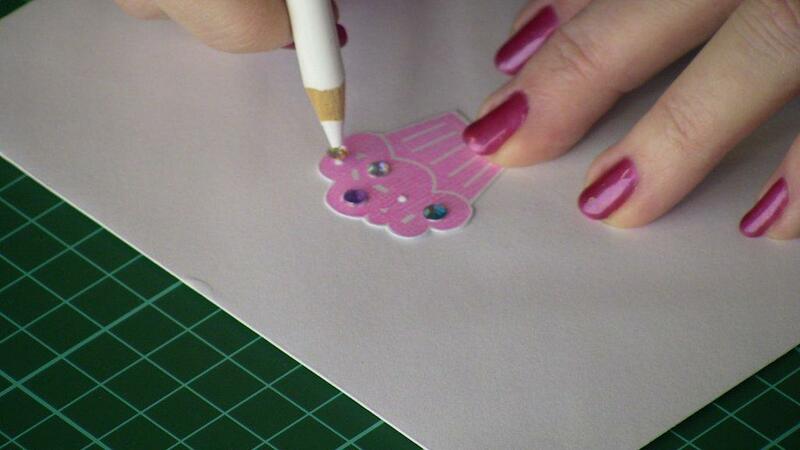 Well I sharpened this pencil (not too sharp – it doesn’t need a real point), still puzzled as to how it could work and I started to play with it by adding gems to a cupcake I was adding to a card. Placing a tiny dob of Stix2 PVA Glue to the spot I then placed the Pick Up Pencil on the gem and WOW it picked it up first go! I was excited….. I then placed the gem on the glue and gave it a gentle push to help the glue bond and WOW again the gem had released from the pencil. No need to use fingernails or another releasing tool (like some gemsetter’s require). It was all so quick and painless. I had watched our YouTube demonstration (http://www.youtube.com/watch?v=xLKOnA2eCbY&feature=player_embedded) and heard about the other embellishments the Stix2 Pick Up Pencil could handle (Gems, Rhinestones, Buttons, Pins – anything shiny), but decided to explore a little more. This was when I created my page ‘…Boogie Babe…’ and found it worked perfectly with sequins. Even my 9 year old daughter had a go when she was doing some craft projects and found that it easily picked up small pieces of Cardstock she was using in her Punch Art Cards. WOW – I always fumble with tweezers – can never squeeze well enough to hold things in place. But, I don’t think I’ll ever need to worry now I have my Pick Up Pencil. I’ve replaced my ‘GEM Tool’ with a much more user friendly Pencil! Why don’t you consider adding this tool to your pencil case? It’s available from our website www.stix2.com.au for $4.95.